The renowned Aman Resorts’ first foray into yachting in Indonesia, Amanikan is a 32-metre coastal cruise that was custom-built in 2009. Combining the essence of historical cruisers with modern comforts, Amanikan boasts Aman Resorts’ renowned extraordinary service. She was built initially to combine with Amanwana, a luxurious tented camp on the private island of Moyo, just off the coast of Sumbawa. 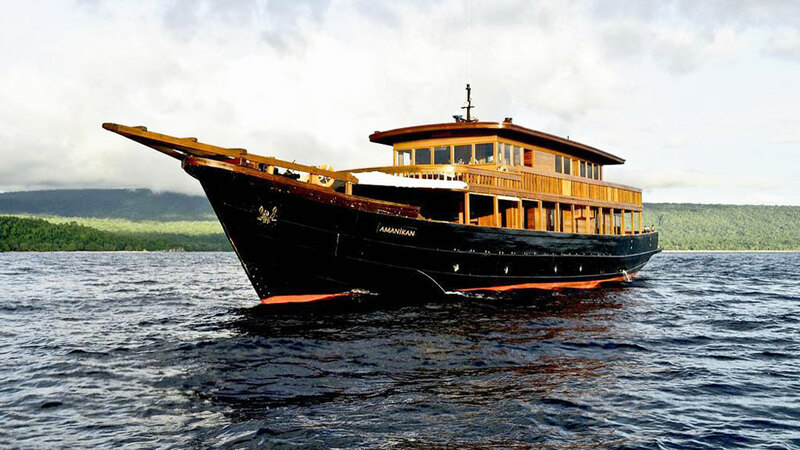 This unique vessel is available to charter throughout the archipelago, mainly cruising in Komodo National Park, the Bandas – also known as the original Spice Islands – and Raja Ampat, a collection of islands close to West Papua. Amanikan offers dedicated expeditions, such as the Komodo Expedition, which visits the World Heritage site famed for its prehistoric Komodo dragons and exquisite coral reefs. The Spice Island expedition explores the Banda Sea’s seven volcanic islands that were once home to a thriving spice trade, while the Raja Ampat Expedition heads to one of the most remote and biologically diverse collections of beautiful islands with thriving marine life. Amanikan can be combined with Aman’s second boat – Dira – as the ultimate getaway for large groups of up to 16 guests accommodated in the two boats. She is a perfect option for Amanjunkies and intrepid travelers alike seeking the journey of a lifetime, and her crew of 10 includes a private chef, a cruise director and a dive guide. Due to the nature of her design, Amanikan uniquely offers 3 luxurious cabins above deck decorated in beautifully neutral cream, caramel and fawn tones with antique brass fixtures, all with their own terraces. The expansive master cabin boasts a king-size bed, situated at the stern of the upper deck, and panoramic 270-degree views from wraparound windows, as well as a large private sundeck. The 2 additional cabins have vaulted ceilings and feature sustainable furnishings, one with a private balcony and the other with a semi-private sundeck in front of the wheelhouse. All cabins have en-suite bathrooms with double vanities, showers and separate toilets. Amanikan has a foredeck with an outdoor dining and bar area, as well as a lounge with an open-air cinema system. The experienced staff caters to all guests’ individual needs, and the chef serves up a combination of international and Asian cuisine. Onboard facilities include air-conditioning, portable Bose docking stations, kayaks and fishing gear, as well as all snorkeling and diving equipment.